For most people, prom is their first formal event and we have the means to make you look and feel like the best dressed version of you! Emanuele Tuxedo can capture any personal style, from the most traditional to the most expressive. We carry numerous styles and accessories to compliment your prom date. Not only that, but we have prom tuxedos starting at $70! Looking great and smart enough to save money? Someone might just get a few more prom dates! 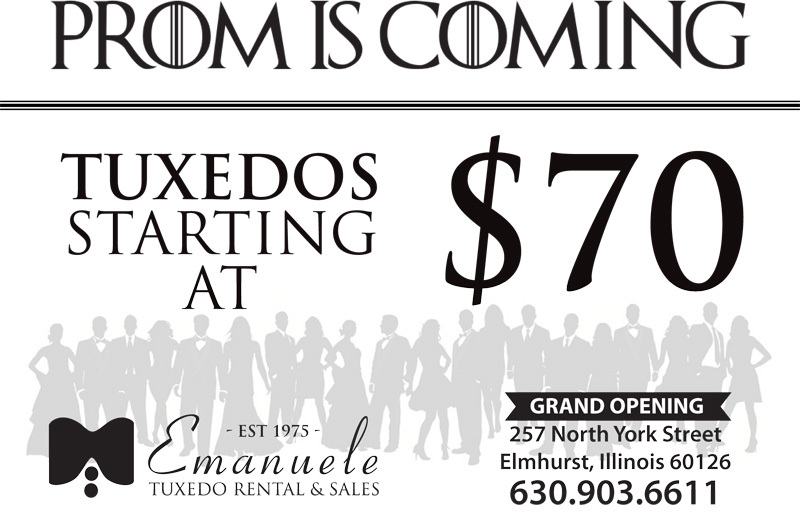 All Tuxedos are in stock and able to try on! Free Tux! Become a Prom Rep! Earn a Free Tuxedo by becoming a Prom Rep! 3. Pass out our coupons to your fellow classmates. When 5 of your referrals book their tuxedos through us, your tuxedo is free! Every additional 5 bookings, earn $20 cash!